FNZee's LaCueva Blended personally by Tatuaje's Pete Johnson, and hailing from Don Pepin's Tabacalera Cubana factory, each cigar is well-balance and provides plenty of big-time flavor. 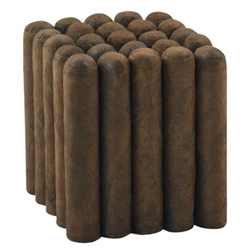 At play is an Ecuadorian Habano wrapper, draped over a core of Nicaraguan and Connecticut Broadleaf long-fillers. The end result is a cigar exuding notes of leather, earth, nuts, roasted coffee bean and undeniable hint of sweetness. Boasting a resounding similarity to some very high end pricier offerings, FNZee's LaCueva is worth far more than the asking price.